Mini version of TFV8 tank with 3ml capacity, redesigned bottom air slots, air chamber, and drip tip. Dual, Quad, and Octo coils available for ultimate flavor and vapor production. TFV8 Baby, with about 2/3 size of TFV8, adopts new Turbo engines - V8 Baby-Q2 Dual Core, V8 Baby-T8 Octuple core and optional V8 Baby RBA. Meanwhile, its airflow system: the bottom pair air-slots, the air chamber, the drip tip, are re-designed after precise calculations and optimizations. All those efforts ensure that TFV8 Baby is another Cloud Beast - a Baby Beast. TFV8 baby is the best choice for mini tank fans. The tank itself is beautiful. Doesn't leak which is exactly what I was looking for. Sadly, the coils are absolute trash. They don't even last a week at the "recommended" wattage. Would not recommend this product. Its small but it smokes well and doesnt leak! Thats key for me. The beast leaks and so I had to abandon it and return to my baby! Only downside is it can be a bit difficult to remove the coil and I have to use needle nose pliers sometimes, but worth it if it doesnt leak and waste my precious juice! The Freemax Mesh Pro Subohm Tank comes with optional 5ml/6ml juice capacity. It adopts the innovative Mesh Pro coil system, which comes with different kinds mesh coils for optimal flavor and massive clouds. 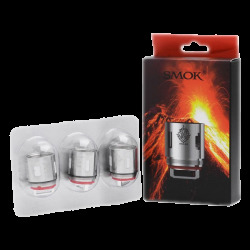 SMOK TFV8 Baby V2 features a new design with a "V" carved on the top cap and base, 5ml liquid capacity, antibacterial medical cotton and mesh coils. The Freemax Twister Glass Tube is designed for Freemax Twister kit.There are 3ml/5ml tube for Standard Editon and 2ml/4ml tube for TPD Edition. Just get it as a spare part. Snap closure plastic case to safely store and carry 4x 18650 batteries.